The domain within your query sequence starts at position 179 and ends at position 227; the E-value for the FN2 domain shown below is 4.83e-27. 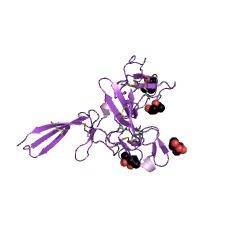 One of three types of internal repeat within the plasma protein, fibronectin. Also occurs in coagulation factor XII, 2 type IV collagenases, PDC-109, and cation-independent mannose-6-phosphate and secretory phospholipase A2 receptors. In fibronectin, PDC-109, and the collagenases, this domain contributes to collagen-binding function. 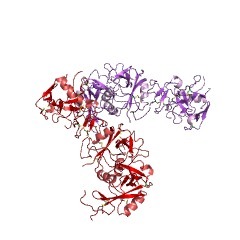 Fibronectin is a multi-domain glycoprotein, found in a soluble form in plasma, and in an insoluble form in loose connective tissue and basement membranes, that binds cell surfaces and various compounds including collagen, fibrin, heparin, DNA, and actin. Fibronectins are involved in a number of important functions e.g., wound healing; cell adhesion; blood coagulation; cell differentiation and migration; maintenance of the cellular cytoskeleton; and tumour metastasis [(PUBMED:3031656)]. The major part of the sequence of fibronectin consists of the repetition of three types of domains, which are called type I, II, and III (also called FN1, FN2 and FN3 respectively)[(PUBMED:3780752)]. In fibronectin the type II domain is duplicated. 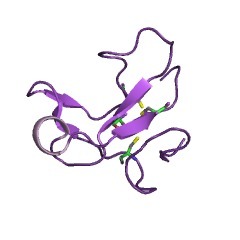 Type II domain is approximately forty residues long, contains four conserved cysteines involved in disulphide bonds and is part of the collagen-binding region of fibronectin. 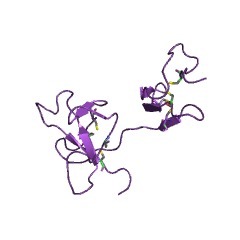 Type II domains have also been found in a range of proteins including blood coagulation factor XII; bovine seminal plasma proteins PDC-109 (BSP-A1/A2) and BSP-A3 [(PUBMED:3606570)]; cation-independent mannose-6-phosphate receptor [(PUBMED:1323236)]; mannose receptor of macrophages [(PUBMED:2373685)]; 180 Kd secretory phospholipase A2 receptor [(PUBMED:8294398)]. DEC-205 receptor [(PUBMED:7753172)]; 72 Kd and 92 Kd type IV collagenase (EC 3.4.24.24) [(PUBMED:2834383)]; and hepatocyte growth factor activator [(PUBMED:7683665)]. There are 8036 FN2 domains in 4453 proteins in SMART's nrdb database. Taxonomic distribution of proteins containing FN2 domain. This tree includes only several representative species. The complete taxonomic breakdown of all proteins with FN2 domain is also avaliable. Click on the protein counts, or double click on taxonomic names to display all proteins containing FN2 domain in the selected taxonomic class. The NH2-terminal fibrin-binding site of fibronectin is formed by interacting fourth and fifth finger domains. Studies with recombinant finger fragments expressed in Escherichia coli. 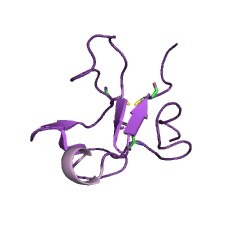 The NH2-terminal 29-kDa Fib-1 fragment consisting of the first five finger modules of fibronectin (F1-5) binds reversibly to fibrin and facilitates cross-linking by Factor XIII. To narrow down the fibrin-binding site within this region, we have used recombinant technology to express a number of individual fingers, rF1, rF2, rF3, rF4, and rF5, and their pairs, rF1-2 rF2-3, and rF4-5, as fusion proteins in Escherichia coli. 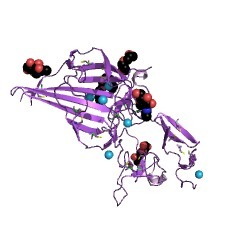 These recombinant fragments were separated from the carrier maltose-binding protein by digestion with human factor Xa or other proteases, and their structural integrity was confirmed by spectroscopic and calorimetric methods. The recombinant F1 and F4-5 exhibited fluorescence-detected melting transitions of the same magnitude and with the same midpoint (Tm) as their natural analogues prepared from Fib-1 by proteolysis. Differential scanning calorimetry experiments further demonstrated that these fragments are properly folded and have compact structures identical to the natural ones. Isolated rF4 melts at a much lower temperature than rF5 or the bimodular fragment rF4-5, indicating the loss of a stabilizing interaction between fingers 4 and 5. Comparison of fluorescence spectra of individual rF4 and rF5 with that of rF4-5 was also consistent with an interaction that affects the environment of Trp residue(s). rF2 also melts at a lower temperature than rF3 or rF2-3, suggesting a stabilizing interaction between the second and third fingers as well. When tested on fibrin-Sepharose, only the bimodular fragment rF4-5 was able to bind. All other fragments, including individual fingers 4 and 5, failed to bind. Thus, fibrin binding is not a common property of all fingers. The results indicate that a recognition site for fibrin is located within fingers 4 and 5. The interaction between these neighboring domains may play an important role in proper orientation of the residues forming this site. 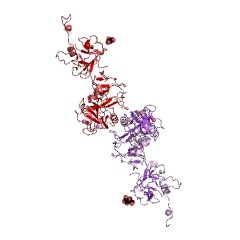 Significant progress has been made recently in the determination of the structure and assembly of the important matrix protein fibronectin, a molecule mainly constructed from three modular units denoted Fn1, Fn2 and Fn3. Atomic resolution structures are now available for all three single modules, for Fn1 and Fn3 module pairs, and for the disulphide-linked join between fibronectin monomers. Combined with results from new binding and mutation studies, the new structural information is leading to a clearer view of structure/function relationships in intact fibronectin. 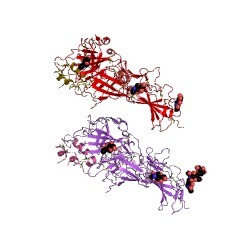 Further characterization of the NH2-terminal fibrin-binding site on fibronectin. The fibronectin (Fn) monomer contains two major sites of fibrin binding affinity present within the NH2-terminal and COOH-terminal domains; they consist of five (1F1-5F1) and three (10F1-12F1) consecutive type 1 modules, respectively. 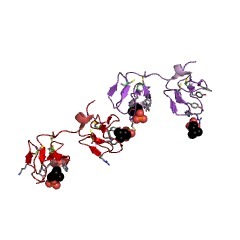 Recently, we have reported that the fourth and fifth type 1 module pair (4F1.5F1) of the NH2-terminal domain of fibronectin demonstrated fibrin binding ability (Williams, M. J., Phan, I., Harvery, T. S., Rostagno, A., Gold, L. I., and Campbell, I. D. (1994) J. Mol. Biol. 235, 1303-1311). In an attempt to further localize fibrin binding activity and to characterize the nature of the interaction between different type 1 modules of Fn and fibrin, we have tested a range of recombinant proteins and subtilisin generated proteolytic fragments of Fn in an enzyme-linked immunosorbent assay (ELISA) and by fibrin affinity chromatography. Of the recombinant proteins, we found that only the 4F1.5F1 exhibited significant fibrin binding activity, while 1F1, 1F1.2F1, 7F1, and 10F1 had little to no affinity for fibrin. On a molar basis, 4-5 times more 4F1.5F1 than a proteolytic fragment, corresponding to 1F1-5F1 (25.9 kDa) was required to cause 50% inhibition (IC50) of intact biotinylated Fn binding to fibrin in a competitive ELISA. This suggests that all five type 1 modules in tandem engender higher fibrin binding activity than the 4F1.5F1 alone. 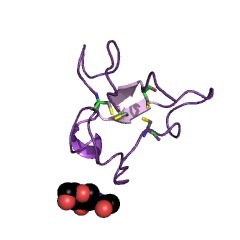 Furthermore, since fibrin binding activity of the intact Fn molecule was inhibited, by 70-80%, by the 4F1.5F1, the 25.9-kDa fragment, and a MoAb mapped to an epitope on the 4F1.5F1, the fibrin-binding site within the 4F1.5F1 contributes greatly to the non-covalent interaction of intact Fn with fibrin. These results provide significant insight into the Fn/fibrin interaction, a major component of the processes of wound repair and fibrin matrix assembly. Collagen-binding recombinant fibronectin fragments containing type II domains. Each of the two type II domains and four larger fragments, containing one or two type II domains of fibronectin, have been expressed in Escherichia coli. 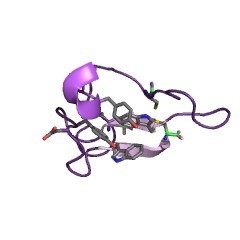 A special vector, containing a fragment encoding the cleavage site for Factor Xa, Ile-Glu-Gly-Arg, inserted immediately before the protein fragment of interest, was used. After treatment of the purified fusion proteins with reduced/oxidized glutathione, the correctly folded fibronectin fragments were released by proteolytic digestion with Factor Xa. The largest fragment, consisting of two type II and two type I domains, was the only fragment able to bind to immobilized gelatin. 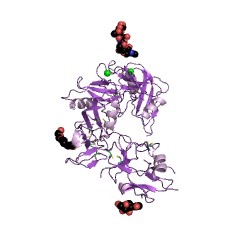 Refined solution structure and ligand-binding properties of PDC-109 domain b. 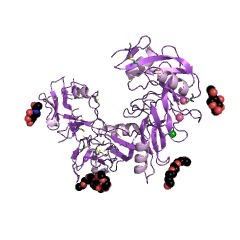 A collagen-binding type II domain. We have determined, via 1H-n.m.r., the solution conformation of the collagen-binding b-domain of the bovine seminal fluid protein PDC-109 (PDC-109/b). The structure determination is based on 341 interproton distance estimates and 42 dihedral angle estimates: a set of 24 initial structures were computed; 12 using the variable target function program DIANA, and 12 using the metric matrix program DISGEO. These structures were optimized by restrained energy minimization and dynamic simulated annealing using the CHARMM and X-PLOR programs. The average pairwise root-mean-square difference (r.m.s.d) between the optimized DIANA (DISGEO) structures is 0.71 A (0.82 A) for the backbone atoms, and 1.73 A (2.03 A) for all atoms. Both sets of structures exhibit the same global fold, secondary structure and placement of most non-polar side-chains. Two central antiparallel beta-sheets, which lie roughly perpendicular to each other, and two irregular loops support a large, partially exposed, hydrophobic surface that defines a putative binding site. A test of a hybrid relaxation matrix-based distance refinement protocol (MIDGE program) was performed using a normalized 250 millisecond NOESY spectrum. The resulting distances were input to the molecular mechanics/dynamics procedures mentioned above in order to optimize the DIANA structures. Our results indicate that relaxation matrix refinement of distances is most useful when used conservatively for identifying underestimated distance constraints. 1H-n.m.r. monitored ligand titration experiments revealed definite, albeit weak, binding interactions for phenethylamine and leucine analogs (Ka less than or equal to 25 M-1). 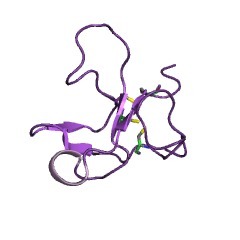 Residues perturbed by ligand binding include Tyr7, Trp26, Tyr33, Asp34 and Trp39. These results suggest that PDC-109/b may recognize specific leucine and/or isoleucine-containing sequences within collagen. Evidence for the involvement of type II domains in collagen binding by 72 kDa type IV procollagenase. The fibronectin-related region of the 72 kDa type IV procollagenase has been expressed in E. coli as a beta-galactosidase fusion product. 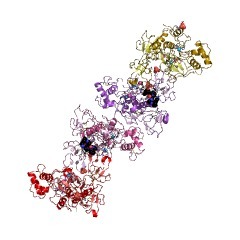 The fragment containing the three type II units of the protein was found to have affinity for denatured collagen, suggesting that these domains may be responsible for the collagen-affinity of type IV collagenase. We have also shown that segment Ala-Ala-His-Glu of type IV collagenase (residues 372-375), which is similar to a fibronectin-segment previously implicated in collagen-binding, is not essential for binding activity. 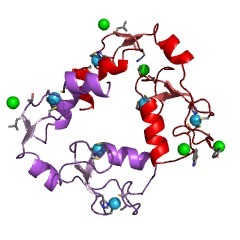 The collagen-binding site of type-II units of bovine seminal fluid protein PDC-109 and fibronectin. A single type-II domain has been isolated by limited proteolysis of the collagen-binding bovine seminal fluid protein, PDC-109. The 45-residue fragment corresponding to the second type-II domain of the parent molecule was found to have retained affinity for immobilized collagen, indicating that this minidomain carries critical regions of the collagen-binding site. 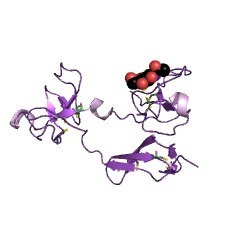 Studies on various fragments of fibronectin have also implicated the two type-II units of this molecule in collagen-binding. In the present work we have found that type-II domains of human fibronectin, expressed in Escherichia coli as beta-galactosidase fusion proteins, bind specifically to immobilized collagen. 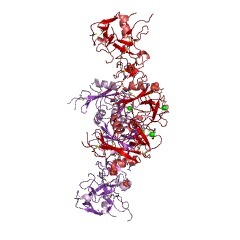 Mapping the collagen-binding site of human fibronectin by expression in Escherichia coli. 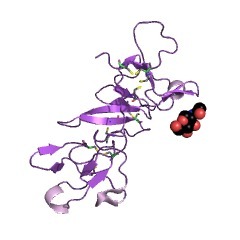 The collagen-binding domain of human fibronectin has been expressed as a cro/beta-galactosidase fusion protein in Escherichia coli. 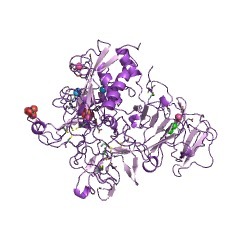 The hybrid polypeptide was recognized by an anti-(human plasma fibronectin) serum and bound specifically to gelatin-Sepharose. The collagen-binding region was subdivided by constructing a series of overlapping bacterial expression plasmids. 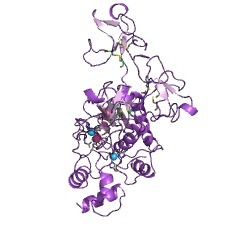 The fusion proteins produced by these constructs were analysed for gelatin-binding activity. The results indicate that the binding site lies within an approximately 12.5 kd fragment of fibronectin, and show that the following 14 amino acid sequence is critical for gelatin-binding activity: Ala-Ala-His-Glu-Glu-Ile-Cys-Thr-Thr-Asn-Glu-Gly-Val-Met. This sequence links the second type II homology unit with the adjacent type I repeat in the amino-terminal third of the fibronectin molecule. 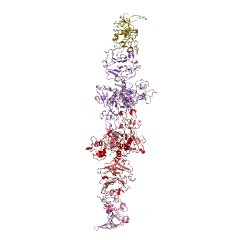 Partial primary structure of bovine plasma fibronectin: three types of internal homology. Location of a collagen-binding domain in fibronectin. Preferential labeling of COOH-terminal sequences in newly synthesized fibronectin was achieved by short term incorporation of radiolabeled amino acids in the presence of pactamycin, an inhibitor of polypeptide chain initiation. The labeled fibronectin was then cleaved with cathepsin D under conditions that yield a large (137,000-dalton) fragment that lacks collagen-binding properties, and a smaller (72,000-dalton) fragment that retains the ability of fibronectin to bind to collagen. 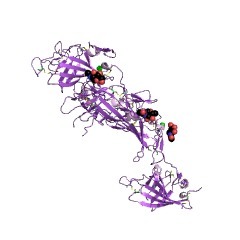 Determination of the relative specific radioactivities of the two fragments leads us to conclude that the collagen-binding domain in fibronectin is located in the NH2-terminal third of the polypeptide chain and not in a COOH-terminal region as previously indicated by other structural studies. This information is based on mapping of SMART genomic protein database to KEGG orthologous groups. Percentage points are related to the number of proteins with FN2 domain which could be assigned to a KEGG orthologous group, and not all proteins containing FN2 domain. Please note that proteins can be included in multiple pathways, ie. the numbers above will not always add up to 100%.